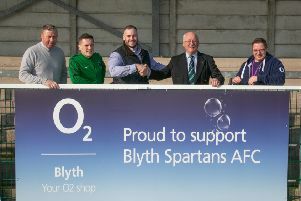 Blyth Spartans manager Tom Wade was understandably delighted with his side’s 1-0 victory at Salford City on Tuesday. An Aaron Wearmouth goal, his first of the season, secured the three points for the league leaders. “It was a tough game,” he said. “Salford aren’t in good form at home but have beaten Barwell and Buxton away, and we know they have signed some excellent players making them a strong side. “It was a huge pitch and it took us some time to adjust to it and get our distances right. “When they went down to ten men we put Hooksy [Neal Hooks] on to retain the ball and get us going forward a bit more. “Having our right back, Andrew Cartwright, bombing forward and delivering the cross which lead to the goal, showed our will to win. We obviously wanted to get the three points but I’d have taken a draw. Looking forward to the FA Cup tie at Spennymoor on Saturday, Wade added: “We should have a full squad available.